Viburnum erubescens 'Eskimo' is a cross between Viburnum Cayuga and Viburnum Utile, making a wonderful dense semi-evergreen shrub that is smothered in pure white, snow ball like inflorescence in May. The heavy crops of lightly scented summer flowers open from white buds that are tinged with pink. The semi-evergreen foliage is glossy dark green in all seasons and will only fall in very cold winters. The white tubular flowers of Viburnum 'Eskimo' are followed by sparse red fruits that mature to black. 'Eskimo' was first introduced in 1981 from the U.S National Arboretum and makes a wonderful small garden tree or shrub. This variety of Viburnum prefers a moist, well-drained site in a sunny or partially shaded position. It has an estimated final height and spread of 2 x 2m. 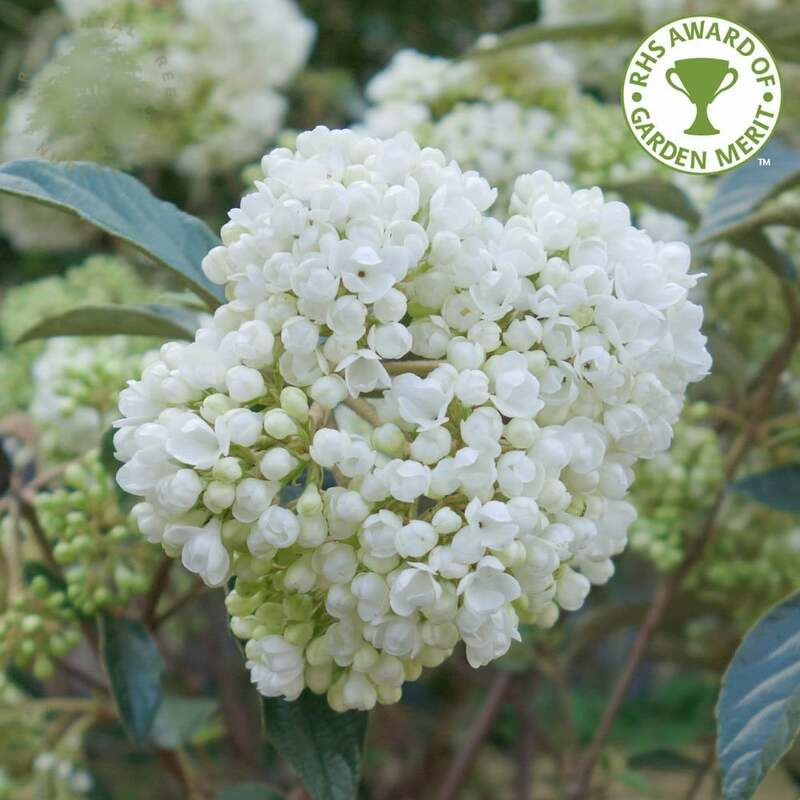 Our pot grown Flowering Viburnum 'Eskimo' can be planted at any time of the year. Start by removing weeds and grass within a metre of your desired planting hole, then dig a square hole as deep as the root mass and approximately 2x as wide. To help the bush establish more effectively, sprinkle root grow in the hole. Gently loosen the roots and place into the planting hole. Mix 50% of your original soil with 50% high quality compost, then fill in the hole and firm around gently. Make sure not to bank the soil up around the collar of the bush. If you’re planting Flowering Viburnum in spring, summer or dry weather, water well and regularly for the first few months. Keep an eye on young bushes and increase watering if there are extended periods of hot or dry weather. If you’re planting in autumn, you may only need to water a little. We stock a range of irrigation kits to assist watering. Once planted, it is important to keep the area free of competing weeds for the first couple of growing seasons. Simply prune your Viburnum after flowering but avoid pruning any new shoot growth if your area is prone to frost. Mature Viburnum can be thinned out to improve their shape. Cut back any crossing, damaged or crowded branches.